At the end of January 2012 the original view of the Church building was restored with the removal of the large trees. A picture of the new view of the building can be seen below. For comparison, the old view is visible when you hover over the picture. The annual RNLI SOS tea afternoon, held in late February again raised much needed funds for the lifeboats. This years Souper Sunday lunch in aid of the Church of Scotland HIV Aids project was well attended with much soup consumed! 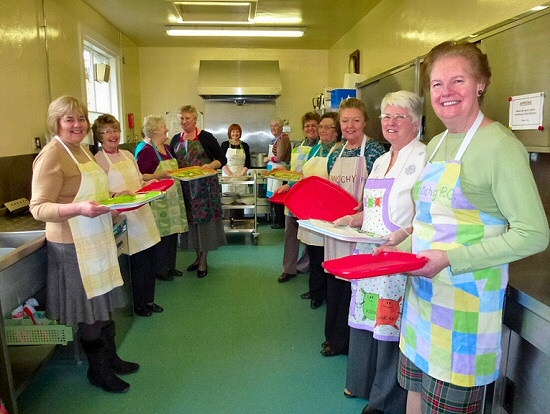 A picture of the ladies all ready to serve is shown below with more available in the photo gallery. All ready for Souper Sunday! On the 5th and 6th of March, the new Stained Glass Windows were installed which commemorate the union to form Bennochy Parish Church. The 11th March saw a new Memorial Service introduced in the afternoon which invited all the family and friends connected with Bennochy Church, the Parish or whose funeral had been conducted by the minister over the previous year. 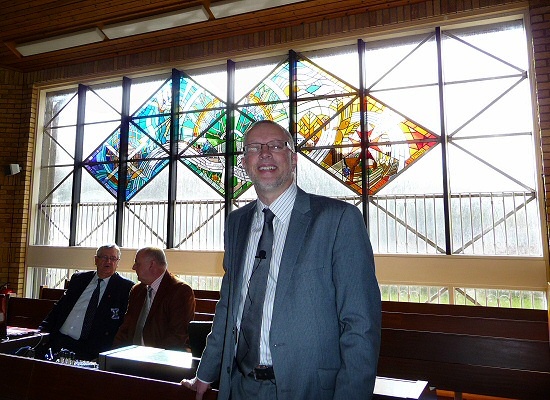 The new Bennochy Stained Glass Windows were dedicated during a special service on 18th March. Many guests including the designer Shona McInnes, relatives of the benefactors and previous ministers associated with the building were present. The afternoon sun shone brightly to show the windows to best effect. After the service tea, coffee and a wide selection of sausage rolls and cakes were available! 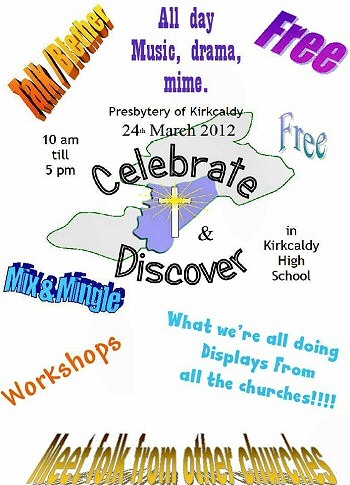 On Saturday March 24th Bennochy Parish Church joined the other Churches in Kirkcaldy Presbytery at the first Celebrate and Discover day held at Kirkcaldy High School. Each Church presented its own stand with photographs of Church life and information about the Church, its people and activities. The main hall hosted the exhibitions along with ad-hoc singing groups and choirs. 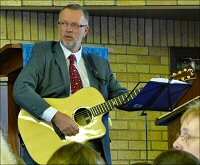 At the end of the day a closing worship was held including a Presbytery wide Choir and Praise Band. In the classrooms, various workshops were held with Bennochy providing a video on the new stained glass windows and a talk on website design. In the staff room a special show of items related to Jenny Featherstone and her work in Zambia was presented. On their second visit to Bennochy Church, The Albany Church Deaf Choir from Edinburgh participated in the morning service on the 13th May and entranced the congregation with their sign-language singing. 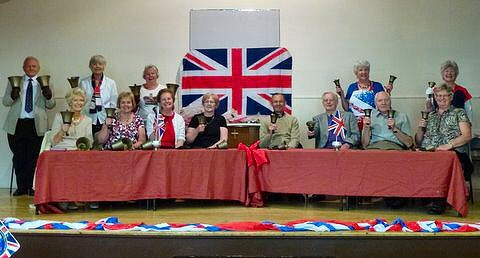 The Queens' Diamond Jubilee in June was celebrated with special bunting and appropriately coloured flowers for the Sunday service. 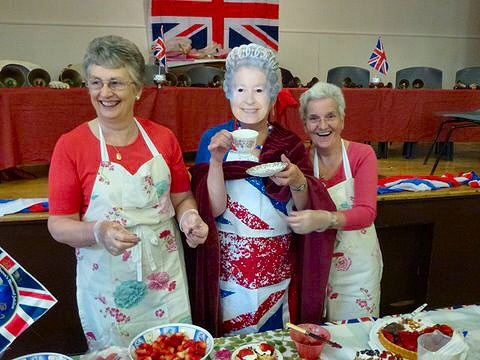 To coincide, the first strawberry tea of the year also celebrated the jubilee as shown in the gathering below, with some interesting guests in disguise. A fun day with Barbecue was held on the 23rd June with the weather relenting from the recent heavy rain just in time! The renowned African Children's Choir visited the Bennochy Church building for the second time to perform a concert on the 21st September as part of their UK tour. The children stayed with local families prior to the concert which was held in aid of the Music for Life charity. 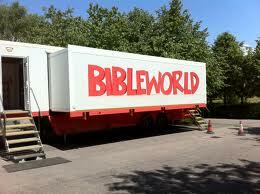 A special visit by the Bibleworld Mobile was made to Kirkcaldy where the travelling trailer was sited in the Esplanade Basin car park for two weeks starting on the 29th October. Brought in by the Scottish Bible Society primarily for school children, the highly acclaimed education resource was visited by nine local primary schools with over 700 children enjoying the latest technology to bring the bible to life. 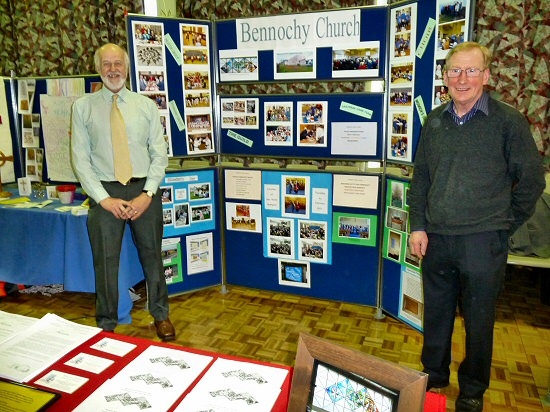 Members of the Bennochy congregation acted as volunteer stewards during the visit and three open days were organised for anyone to experience the attraction. 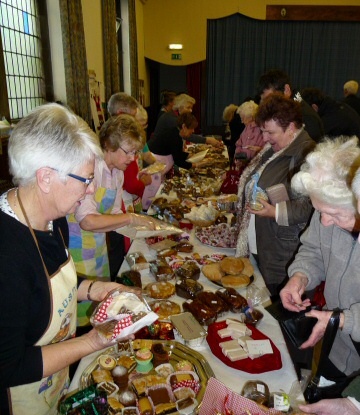 The annual Bennochy Parish Church Christmas Fayre was held in November with an excellent number of vistors buying the donated (and home made) goods and refreshements. 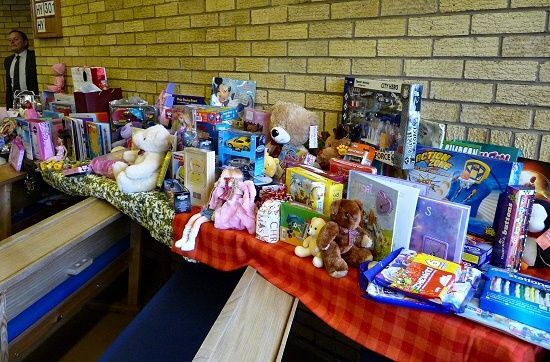 A total of £2,485 was raised for Church funds. 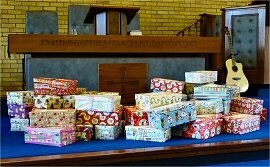 During November the congregation filled many Christmas boxes for distribution by Blythswood Care throughout Eastern Europe. The boxes were presented at a themed Sunday service led by the Wycliffe Bible Translators who explained how the bible is translated into printed, audio and sign language editions for use around the world. Later in the week the lorry uplifted 142 boxes from Bennochy Church and 95 boxes from Dunnikier School before being transported to the depot and then on to countries where there is a lot of poverty. 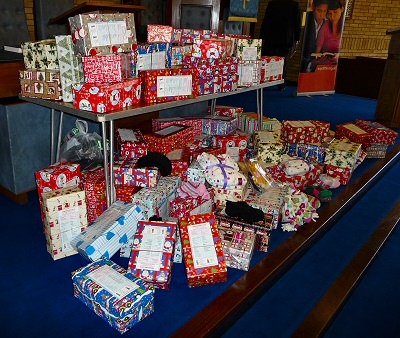 This was a wonderful boost to the appeal and everyone was thanked for filling a shoe box or who gave a donation. 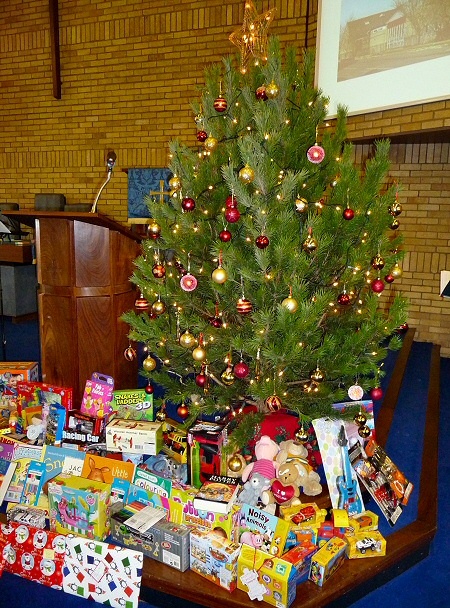 Our support of this charity helps to bring joy and laughter to people at Christmas. The Rev. Dr. Inderjit Bhogal OBE, leader of the Corrymeela Community, was guest preacher at a special evening service on 18th November at which guests from around the Kirkcaldy area were invited. The following day he spoke to MSPs in the Holyrood Parliament. 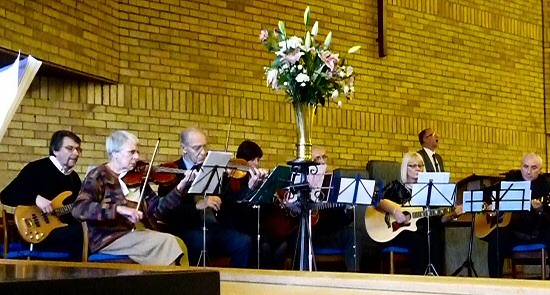 On St. Andrew's Day a charity concert was held to support Maggie's cancer facility in Kirkcaldy. The East Fife Ladies Choir supported by children from the North Primary School raised more than £700 for this worthy cause. The first day of Advent saw our Youth Participation Service which included special slots for the Rainbows, Brownies and Guides who taught the congregation a new song to sing around the campfire. The Boys' Brigade then presented a review of the year highlighting the many exciting activities the boys participate in and the Taekwondo Club explained and demonstrated the many skills they master. 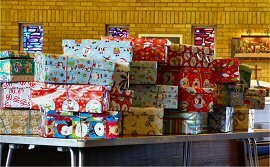 Our traditional Gift Service, where toys and gifts are donated to the Salvation Army for local distribution, was enhanced this year with a live band including well known musician Bruce Davies! The Christmas Gift Service was enhanced by the House Band! The band joined with Brian on the organ for the final two hymns. 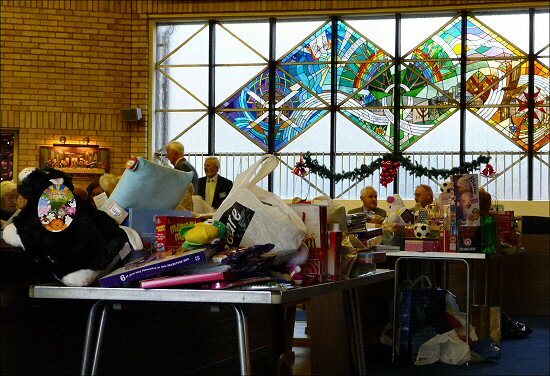 The Salvation Army were also present to accept the wide selection of gifts for local families in need. As this need increases each year, such gifts are very welcome by the recipients. 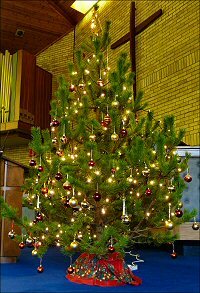 Christmas services this year included the Choir-led Lessons and Carols service followed by the Christmas Sunday morning service with the Sunday School and band accompaniment. 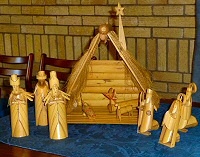 A Watchnight event on Christmas Eve was also held. 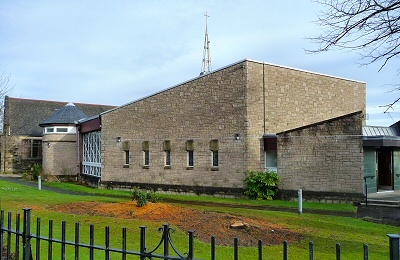 On February 9th, the former St. Andrew's Parish Church building was sold to the Redeemed Christian Church of God who at the time were meeting in Glenrothes. The building had been empty since the union to form Bennochy Parish Church in early 2010. The pictures below were taken at the handover of the keys to the building. 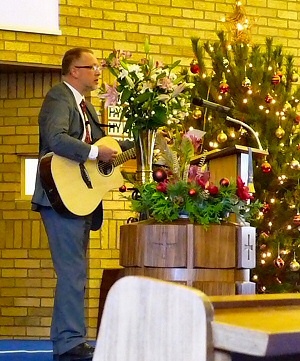 On Saturday 2nd March, congregation member Bruce Davies performed a special musical concert. In a full time performing career spanning 29 years, Bruce has regularly sung all over the UK and USA and this was his first homecoming concert in Kirkcaldy for more than two years. The concert consisted of Bruce performing with his acoustic six and twelve string guitars and singing the songs of his heroes and friends, as well as some of his own award-winning compositions and the best of Scotland’s song repertoire. At the service on 17th March, our missionary partner Jenny Featherstone visited and gave an informative presentation on her work in Zambia. The Guild hosted the East Fife Ladies Choir at their concert evening in March. 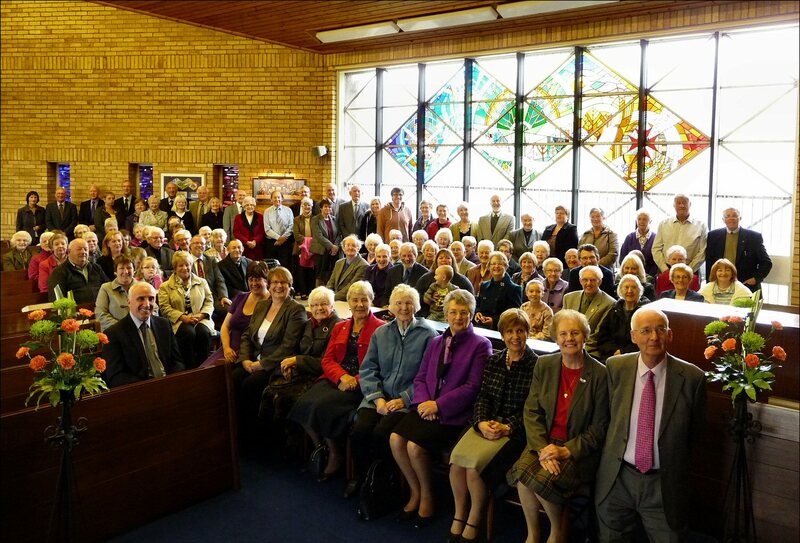 The Fife Deaf Church held their first service at Bennochy Church at the end of March after relocating from their previous home at St. Bryce Kirk. Their services are held on the last Sunday of each month and all visitors are welcome to attend. 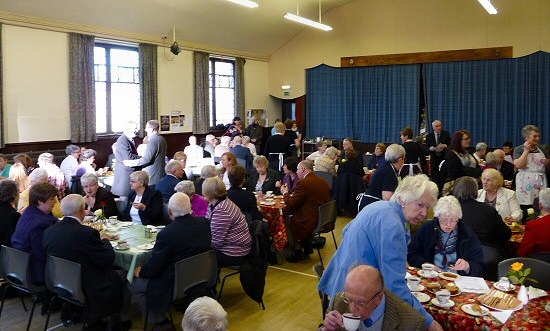 In April over £600 was raised by a Scones and Sponges Afternoon Tea in aid of the Samaritans Kirkcaldy + District who celebrated 40 years of service in 2010 and are in need of funds to improve their Kirkcaldy building. July was marked by the now traditional rota of services spread between the town center churches. This year the major themes of St. Columba were celebrated as 2013 marks 1450 years since his arrival on Iona. At Bennochy we celebrated the "Spiritual Life" of St Columba followed by "On a mission" at St Bryce, "Peace" at Linktown and "Hospitality" at Abbotshall. The first stage in preparing for our new community café saw the Methven Hall painted in a new olive green colour during July to be followed by new curtains. 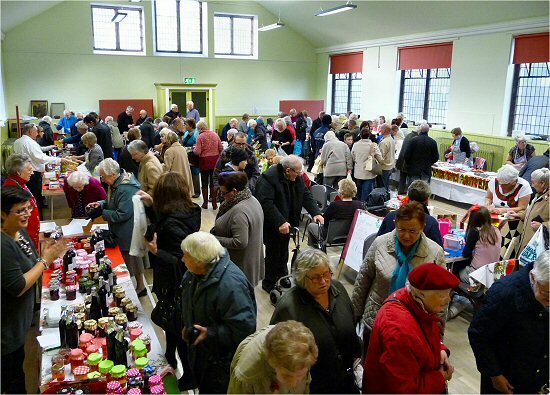 A single Strawberry Fayre was held this year which raised £784 for Church funds. Despite a downpour in the morning, the afternoon event was well attended. A new group offering educational Music, Singing and Movement to pre-school children started in August in the Methven Hall on Wednesday mornings. 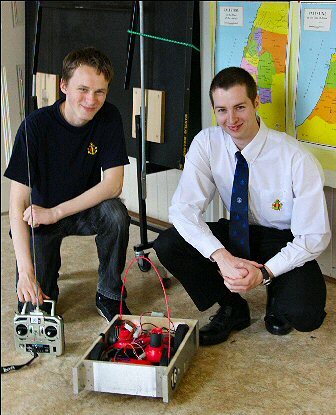 Jo Jingles hold classes around the country and are very popular. On the 24th August, a Fun and Find Out Day was held in the hall and gardens when over 140 mainly local residents spent the afternoon taking part in activities, were entertained and offered free refreshments. As the event’s name suggests, ‘fun’ was very much the theme and there was something for all ages and interests. Outside there was a range of traditional games in which children (and quite a few adults) got totally involved, culminating in a ‘tug of war’. Fortunately there were plenty of hot dogs to help keep up energy levels. Inside, all the halls including the sanctuary, were home to quizzes, robot demonstrations (Boys' Brigade), learning origami (Brownies), a local history display (Kirkcaldy Civic Society), a Taekwondo demonstration (Taekwondo Club) and a piece of community theatre intriguingly entitled ‘Do Elephants Live Upstairs?’ (Suit and Pace). Meanwhile George the Clown wandered round encouraging folk to have a go at all the activities. Refreshments were available from our new community café - "The Olive Branch". The purpose of the event was not only to show what happens in the church throughout the week but also to ask members of the local community what else could be offered. At the "Community Evaluation Stall" everyone had the opportunity to comment on the local area and make suggestions. This was part of our on - going commitment to reaching out to the local community. After 20 years, the Mothers and Toddlers Group has unfortunately had to close. This group provided invaluable support to local mothers allowing them to meet regularly and gain new friendships for years to come. A new venture, The Olive Branch Community Café, opened on the morning of Thursday 12th September serving a selection of freshly made soup and sandwich meals as well as tea/coffee and a selection of other drinks and snacks. The café is open every Thursday from 10.30am until 1.30pm. The first day got off to a very good start thanks to the great support from members of the congregation and the team of volunteers. There were quite a few new faces and hope that these numbers will increase as word spreads. Feedback on the menu was very positive. The team was overwhelmed by the generous donations by members of the congregation of food, ingredients and a range of items. Our annual Harvest Thanksgiving service in late September welcomed donations of non-perishable goods, shown above, for local distribution by the Salvation Army. An offering was also taken to support a carpentry student in Zambia on a course at the Chodart College under the control of Jenny Featherstone, our missionary partner. This picture shows some of the members of the congregation beside the stained glass window during a special photo session for a new jigsaw - sure to be a big seller at the Christmas Fayre! One of our 'older' boys from the Boys' Brigade arranged a special football match at Buckingham Palace on the 7th of October in celebration of grass roots football. Ian Hunter, as president of the Civil Service Football Club, organised the special 150th anniversary match which was hosted by HRH The Duke of Cambridge. This event was widely covered by TV news broadcasts. 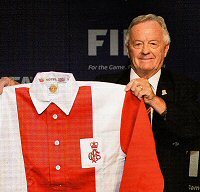 Ian sent his good wishes to all current and previous Boys' Brigade members as well as to John Methven and the team. A special talk was given by Chris Beattie at the 20th October service covering some of the recent activities of KART (Kirkcaldy Area Reachout Trust). To provide greater support for the work of KART, special offerings at Communion Sunday services were donated to KART until the end of 2014. 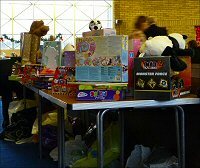 The Christmas Fayre was held as usual in November and was very busy with a wide selection of items for sale. 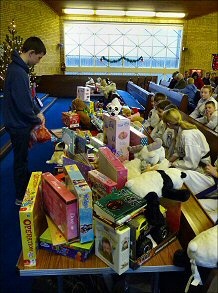 Christmas at Bennochy started with the 1st day of Advent service followed by the annual gift service where toys are donated for local distribution by the Salvation Army. A selection of pictures from the gift service are shown below.